Of the 18 picturesque holes on the Dye Fore course, number 12 and number 15 are two of the greatest par three holes in the world. 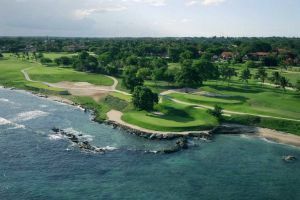 This new addition to the Casa de Campo golf triad is said to rival the Teeth of the Dog course. Dye Fore has spectacular views of the Caribbean Sea, the mountains, the Chavón River below and the Altos de Chavón artists village, said Gilles Gagnon, Director of Golf at Casa de Campo. Visually, the course is intimidating and the par three’s are incredible. Our golf package includes: 18 hole green fee, guaranteed tee-time, golf cart and range balls and includes the 16% tax. Dye Fore Golf Course is not yet in our pool of Golf Courses for orders.